I’ve been making little cardboard houses for about a year and half. Most of the time I make them from templates that I draw and cut out myself. Lately, though, I have been making the little houses from the Tim Holtz Village Dwelling series. He started out late last year with the first one called “Village Dwelling”. It is a simple die with a gable front, a door in the middle flanked by 2 windows. 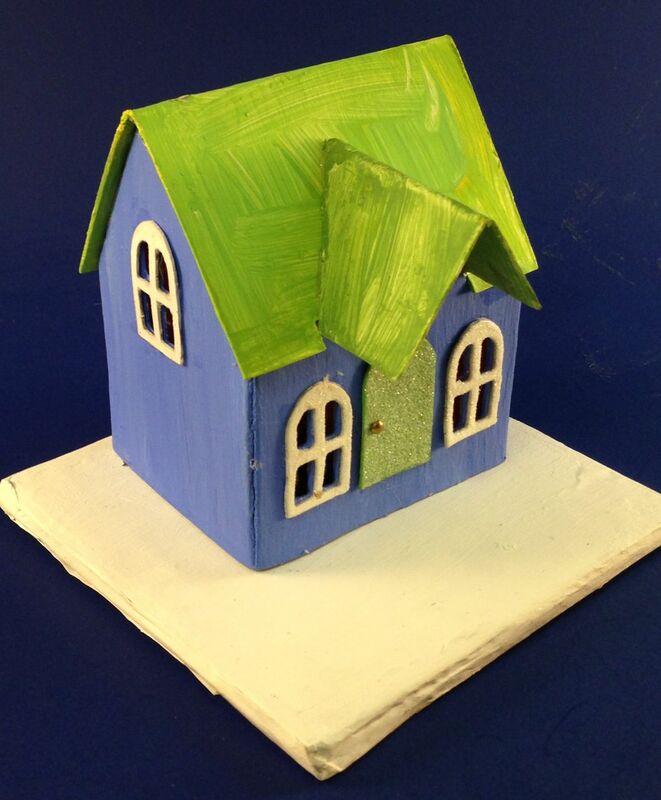 Shown below is a simple (undecorated) house that I made from this die. The next major variation on this series is the “Village Brownstone”. My first house that I made from this was a Christmas church with the bell tower addition. Soon a new addition called the Village Manor will be coming out and I cannot wait because it will bring a whole new dimension to these little houses. 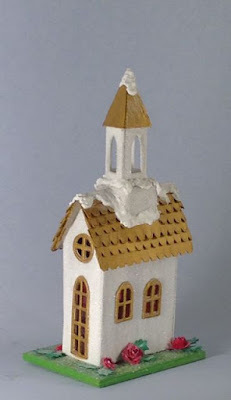 But in the meantime, I have learned some tricks that help in the construction and customization of these little houses. Since I make all my little houses to sell, I want them to last for a long time so I make them out of cardboard rather than card stock. 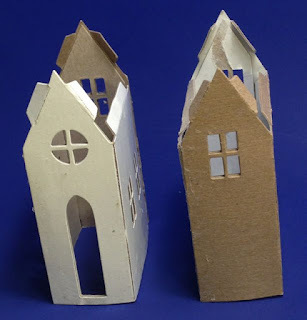 I think it would be easier to score the folds, glue things together if made from card stock or scrapbook paper, but the houses would not be nearly as sturdy. And I always reinforce the cardboard with an extra layer behind each wall. The weakest wall is the wall with the door because there is only a small strip that maintains the form of the house. Sometimes I glue an extra little strip there to make sure the house stays square. See the extra strips below the door on this halloween house. The house was curving under the door so I added extra strips to keep the front wall straight. I almost always make a larger roof because I like larger overhangs. I use the roof piece that comes with the die as an under roof, but I either cut a larger piece of cardboard and glue it on top or make shingles that extend beyond the borders of the roof. You can see on the little blue house at the top of the post that there is not much of an overhang, but the church roof extends a little further out. 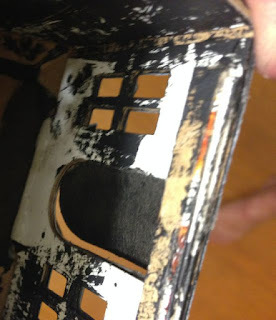 Tim Holtz did a great job designing a bunch of features to fit on one die, but size is a limitation. 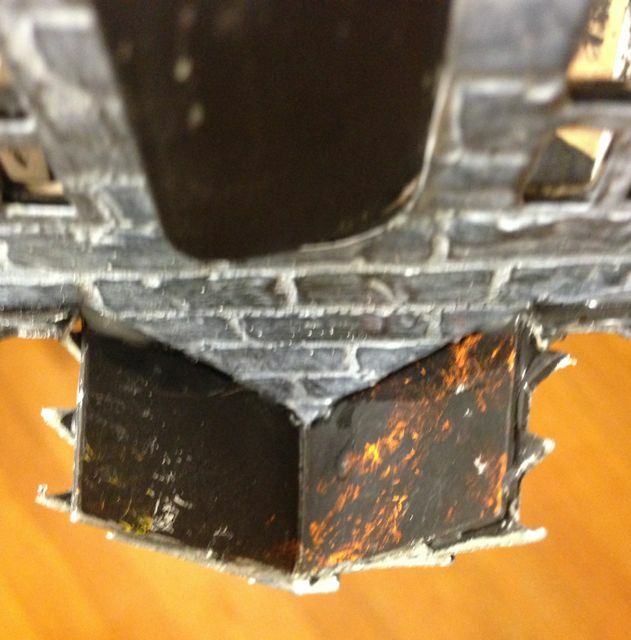 Also remember to paint or cover the visible portion of the overhang before you glue it down. Upside down house showing the underside of the porch overhang. I didn’t paint this one very well, but orange showing through the paint looks ok for a halloween house. Pre-score your folds before gluing. Since I use cardboard, a thicker material, I score the folds a little deeper using a ruler and the back side of my craft knife. That way the folds go completely to the edge and fold better. think the white PVA glues are the most durable. 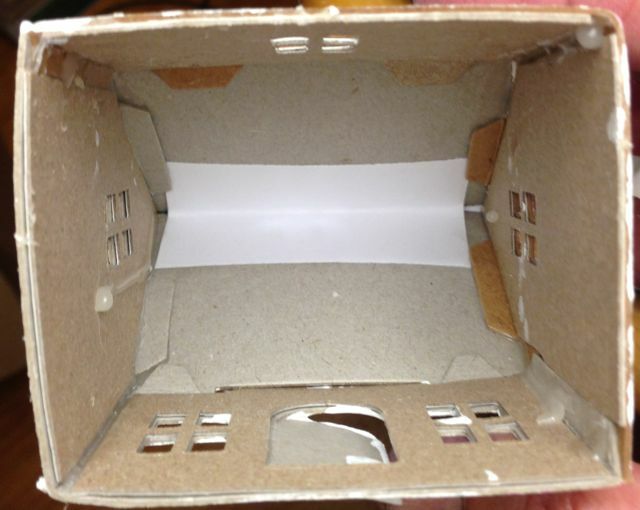 Most of the people who make reproduction putz houses on the Cardboard Christmas forum use some form of white glue. So my choice is based on what I know to be durable. There are an infinite number of ways to customize your houses, but I’d like to mention a variation that makes the buildings a little more flexible. Instead of cutting a front and back piece you can cut 2 back pieces of either the Village Dwelling or Village Brownstone. Because of the size limitations on the dies, the base that comes with the die is relatively small, I make my own base so I can add more scenery. I think fences make a dramatic addition to any little house. Because I want my houses to last for years, I make the fences out of cardboard – 2 or 3 layers. I have some fence punches that will not go through cardboard so for those I glue 4 layers of 65# card stock together to make fences using those particular punches. You can see on other houses on my blog how the fence really helps make the house.